Mixing the benefits of ribbon smoothness and condenser flexibility, Pearl show us that it really is hip to be, erm... rectangular. 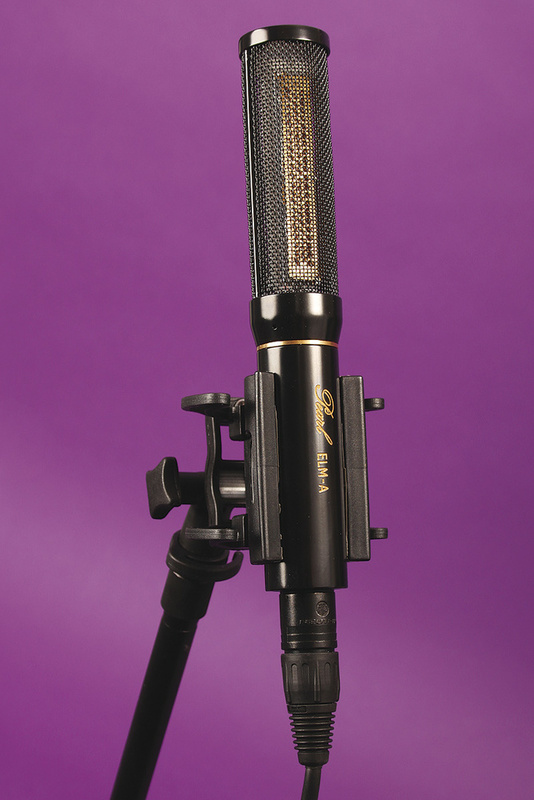 The Swedish‑built Pearl ELM‑A is a FET condenser microphone that looks not dissimilar to the single‑pattern ELM‑C model reviewed by Hugh Robjohns back in SOS July 2006. At first glance, the mic could easily be mistaken for a ribbon model, due to its unusual rectangular capsule. The diaphragm is seven times longer than it is wide, and what looks like a ribbon is actually a pair of back‑to‑back, cardioid capacitor capsules. The overall capsule size of this new model-2700 capsule is 75mm x 15mm, and over half the length of the mic's stick‑like body is taken up by the basket. Also unusual is that this microphone has two separate audio outputs, so that the engineer can adjust the pattern by mixing the outputs in different ways. 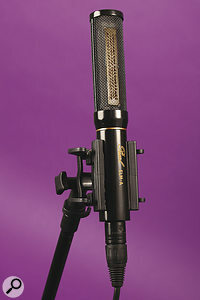 Most multi‑pattern mics do this mixing internally and offer the user a number of switchable positions, but Pearl's approach is attractive because it allows the polar pattern to be adjusted after recording. Clearly, Pearl didn't go to the trouble of building a rectangular capsule just to be different, so what, if any, are the benefits? Well, the overall surface area is greater than that of a typical one‑inch, large‑diaphragm capsule, which helps to keep the self-noise low, at a claimed figure of below 11dB (in fact, the review sample's test sheet showed 9dB). The lack of symmetry also helps distribute resonant modes, whereas a circular diaphragm is more akin to a drum head, and has a specific resonance. A frequency plot included with the mic shows the response to be very flat up to 8kHz, above which is the slightest of presence bumps. The response starts to roll off by 20kHz, though the usable response extends beyond 25kHz. The diaphragms used in this capsule are fabricated from polyester with a thin layer of aluminium — rather than the more usual gold — to make them electrically conductive. These diaphragms are covered by a pair of perforated metal plates, apparently to aid mechanical stability, while the basket comprises only a single layer of mesh, so an external pop shield is highly recommended, especially if recording vocals. Each half of the capsule is wired to its own transformerless output circuit, and the mic's output is on a five‑pin XLR connector to carry the signal from both channels. The mic has no built‑in high‑pass filter options or pads. A cable is included, which breaks out to two three‑pin XLRs, and there's also a Rycote 'lyre suspension' shockmount with the kit. The mic operates from standard 48V phantom power, and a red LED inside the basket confirms that phantom power is reaching the mic. Mics with a circular diaphragm tend to have symmetrical polar patterns in the horizontal and vertical planes, whereas the rectangular diaphragm of the ELM‑A works much like a line‑array loudspeaker in reverse. This translates to a very wide pickup pattern, but at the same time the mic is much more directional in the vertical plane. This can be useful in some situations for excluding spill, whether from other instruments or from wall and floor reflections. Because of the unusual polar pattern of this mic, you have to bear in mind, when positioning it, that although the sweet spot is very wide, you need to be pretty careful to get the vertical angle correct. Move out of the sweet spot and tonality changes quite noticeably. As I've discussed in passing, recording the mic's outputs onto two channels allows the pattern to be adjusted while mixing. If you take only the front‑capsule output, you have a standard cardioid pattern, and adding in the rear capsule gives you omnidirectional. Flip the polarity of the rear capsule and you have a figure‑of‑eight response with good rejection of 90-degrees off‑axis sounds. It's often the case with microphones that they become known for excelling at a particular job — whether vocals, drums, guitars or something else — but the Pearl ELM‑A really does seem to be a 'mic without portfolio'. It can handle a wide range of sounds really well, but there's nothing I could put my finger on as being its main focus. Certainly, though, it is kind to any sounds that might otherwise sound aggressive if recorded using the more usual choices of capacitor microphone. To my ears, the best mics translate high‑frequency detail in a smooth and natural way without actually clouding the detail, and the ELM‑A definitely leans heavily in that direction, though on some sources, such as hand percussion, I felt it lacked a little transient definition. The wide pickup pattern means that room sound tends to be captured in a more favourable way than with many other mics. As the manufacturers suggest, I found during my own tests that this mic sounded more as I'd expect a good ribbon mic to sound than a condenser design, but it didn't suffer from a ribbon mic's low‑sensitivity issues. Its smooth high end would make it well‑suited to strummed acoustic guitars, pianos and drum overheads, and to strings, on those occasions where a ribbon mic isn't bright enough or sensitive enough, but where a traditional capacitor mic might still sound too aggressive. The ELM‑A also works fine on vocals, although I'd say that it probably wouldn't be my first choice in this application — unless working with a particular singer who needed warming and smoothing at the same time, where it might be exactly what you need. I tried several tests on electric guitar, too, both close‑miking the amp and pulling the mic back into the room. Here, the smooth top end and throaty lower mids are very kind to raunchy rock-guitar sounds, and clean chord work also comes across nicely, with plenty of ring but no unwanted fizz. The ELM‑series mics are quite expensive here in the UK, but the mic's natural character, combined with its ability to reject unwanted sounds in the vertical plane, gives it some 'special powers' that competing mics may lack. Furthermore, while having to use two input channels to record the mic in anything other than cardioid mode may seem unnecessarily fussy, the ability to change the mic pattern while mixing is very liberating — and although it's not quite as adjustable as a Soundfield mic in this respect (a Soundfield takes up four audio channels), it is flexible enough to get you out of trouble on occasions, especially when mixing live recordings. Rather than compare the ELM‑A with other capacitor mics, I think my earlier comments relating to its ribbon‑like qualities are actually pretty fair, so if you think of it as a ribbon alternative that is more sensitive than a ribbon, has an adjustable polar pattern and can have its pattern adjusted after recording, that probably gives a more accurate impression of what this mic is capable of. The narrow vertical sweet-spot angle takes a little getting used to, but it can be very helpful in rejecting unwanted sound — and of course you can rotate the mic sideways through 90 degrees if you want a narrow‑but‑tall sweet spot, as you may when miking a wind instrument. If you're looking for a versatile mic that has more of a double‑cream chocolate sound than your typical capacitor, the Pearl ELM‑A may well be worth a look. While there are no direct alternatives I can think of, there are some other mics with rectangular diaphragms, such as the Milab DC196. Some active ribbon designs, such as the SE Electronics RNR1 and Voodoo series, offer similar sound qualities (albeit without the versatility of variable polar patterns). Each mic has an individual test sheet. The figures below are for the actual mic reviewed. Polar pattern: adjustable between cardioid, omnidirectional and figure‑of‑eight, by mixing the outputs. Frequency response (all patterns): 20Hz to 25kHz (±3dB). Dimensions: 32 x 192 mm. Smooth, ribbon‑like sound with none of the sensitivity or fixed-pattern issues of a ribbon. Comes with a Rycote shockmount. Needs two recording channels for polar patterns other than cardioid. While this is perhaps a little left‑field for a capacitor, having a variable‑pattern mic that exhibits ribbon‑like sonic qualities and offers the user the ability to adjust the pickup pattern after recording opens up some very interesting possibilities.